“Does [writing] need to be an act composed by a human entity?” a rawlings asks in her online multidisciplinary work, Gibber. I spoke to a rawlings in her aerie/studio in Reykjavik. I was in Hamilton, Ontario at ground level. GB: In Gibber, you explore how language names/claims the land, how it ‘marks’ it. But, you seem to say that, through a lively, engaged and aware reading, we can unpack the assumptions of language and consider how it can or cannot become part of the ecosystem and/or biosemantic lang/dscape. You explore how the landscape can be read as its own text as opposed to how we read the landscape through our preconceptions, through the conceptual (textual) frame work of our naming, our categorization. Thinking about Barthes’ Pleasure of the Text, would you say that we might imagine the environment a ‘writerly’ text as opposed to a ‘readerly’ one? ar: I thought about Barthes’ Pleasure of the Text, and looked at Gibber gestures through Pleasure’s lens. Marveled at this potential revision: “That is the pleasure of the text: value shifted to the sumptuous rank of the” signified. What does it help us to fashion an ecosystem (or any ecosystem components) as a text, or to fashion an ecosystem (or any…) as a writer of its own text? What does it help us to imagine an ecosystem (or…) as a collaborator? Each analogy roots the relational seed of interconnection; it pursues hope that we can sense our way into healthier relationship with all that surrounds, sustains, confounds. Look again: is language an only / a lonely sense for conceiving the world? What sensory components build the linguistic? Listen well. Gibber may be more about conversation than text. Or if text, then text as representing, archiving, recreating the conversation. The conversation between (human and other-than-human) bodies. Gary, as a fellow Ontario resident, you might get a kick out of this. You’re familiar with Ministry of Natural Resources conservation officers? I grew up in rural Northern Ontario, so conservation officers had greater presence in my formative years than police officers. And here I am, nowadays, always mis-typing as ‘conversation officers’ — though doesn’t that, avec plaisir, demark their craft, too? GB: Maybe I should title this discussion, "A conservation with Ministry of Post-National Resources Conversation Officer, a rawlings." Indeed, I imagine your work in Gibber as some kind of Eco-post-colonialism. Of course this relates very specifically to the Australian context in terms of social colonialism, but also to your other work (e.g. Icelandic) that is eco-post-colonial. There is both a celebration of language, its ability to name, to sound, to make the mouth (and speech, writing, and sound) a landscape to explore, to live in, to celebrate, but language if not carefully and self-consciously considered, limits the landscape QED or OED. I keep thinking about some notion of “eco-slave names” as opposed to a more aware, empathic, and listening awareness of the environment. 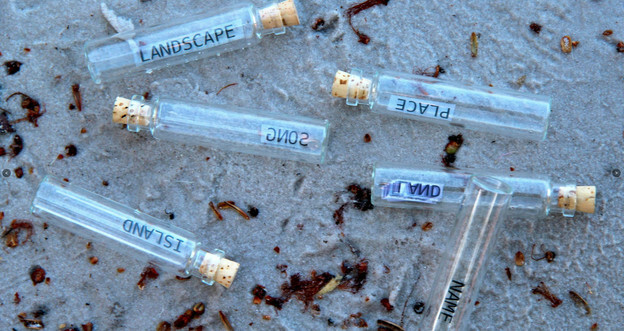 I imagine that the vials containing text point to how ‘language’ is separated from the world. How they are samples taken, contained, removed from what might otherwise be a more natural and in-flux biosemantic relationship the environment. Vials are samples taken. Labels transported. Glass is sand subjected to intense semantic heat. But they are also messages in a bottle. An attempt at communication, often over a long distance. (B)each to (b)each. What washes up/ is washed over? Language? Just wash us. From vials which are invialate and maybe vialating, to a more musical and polyvialent relationship. Viols in polyphony. Let language have no central nervous system but like a jellyfish be everywhere aware. ar: Consider the (ages-old) impacts of soundscape and landscape on linguistic formation — on letter forms, syntactic construction, pronunciation. Imagine, too, the importation / introduction of languages into foreign ecosystems. With the slip of a tongue, what loss? Each of the contained texts (“Land. Song. Landscape. Place. Island. Name.”) makes the reader/view consider how the contained text relates to its meaning in the context of its specific physical location. Land? Sand is a kind of almost land. Liminal. Litoral. Does this land have a specific name beyond the generic category? (And I note that there are many little “land” labels in the vial. It would matter to those living there, yet we abstract with language. That can be helpful but also allows us to blunder on/over. Song? Is this song? Can a song be in a little tactile vial? Is naming song? Is sand? Is the creative interplay between human and nonhuman? Is language a kind of song? Is there a specific song? ar: Gibber is part of a larger project with the cheeky working title Sound Poetry & Visual Poetry. At North of Invention in NYC, Jeff Derksen suggested that I might consider redefining ‘sound poetry’ — a term whose history causes me itchiness. Offering a re-definition also made me itchy (as did coming up with another term which might define/claim the work I do), but I got a giggle from the idea of labeling an entire work Sound Poetry & Visual Poetry without clearly delineating what was what within the work. (Is this a conservationist gesture? Is it more the introduction of an alien species into the fold?) The synaesthetic gesture present within much of the Gibber work interests me. When I listen to an audio recording, what I receive is visual in that I construct the place, its inhabitants based on one sensory input; I subconsciously assume the task, as listener, of crafting the visual. If there is visual poetry on offer in Gibber, then, perhaps it’s (also?) in the audio recordings. And in there, then, is your writerly pleasure. You know, the authorities on cartography would have us believe it’s a visual medium. But consider asking for directions, the verbal disclosure an act of counter-mapping against a dominant hegemonic authority. Consider Aboriginal songlines, a traditional aural cartography. Consider that voice in your head, whenever your eyes wash over an image (of land, of map, with or without text). If there is sound poetry on offer in Gibber, then (also? )… And here, your writing aloud. GB: Gibber asks: What is landscape? It supposes a viewer, a namer, a framer. An inscape, perhaps. Are these few words landscape? Or construction set for a landscape? Is this ‘field poetics’ – words strewn about the page of the sand – landscape? Sandscape? Often language (our conceptual rationalist framework) is our only ‘sense’ for conceiving of the world. But your image in its sensory vividness and details shows us a presentness, a different kind of language listening. Multisensory: Language. Langtennae. Landtennae. &tennae. GB:And in order to read it, I think the image is telling us, we need to take into account the natural world where it is found, where our words and thoughts wash up, where currents pull us, a specific landscape and the tidings it bring us. Gibber is available entirely online. a rawlings is a poet, arts educator, and interdisciplinarian currently based in Iceland. More about her can be found at her website.